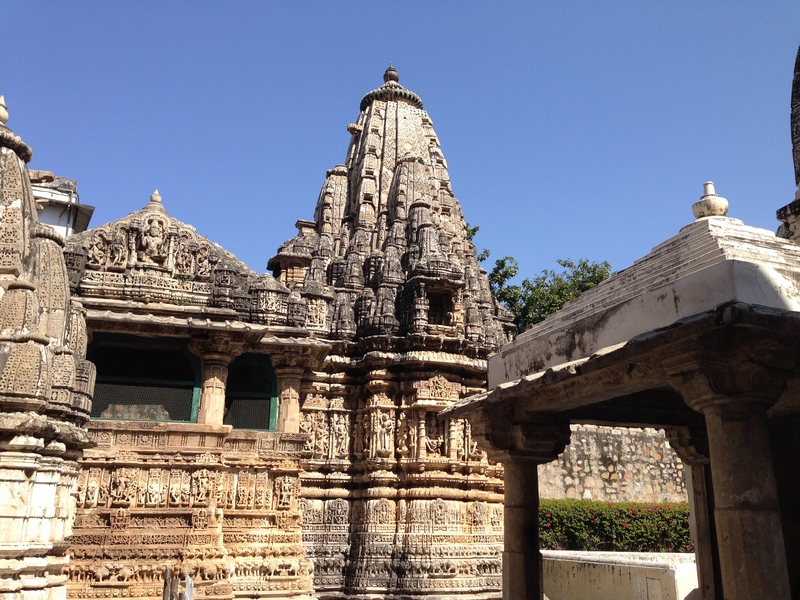 There are several sights near Udaipur that should be on your list. 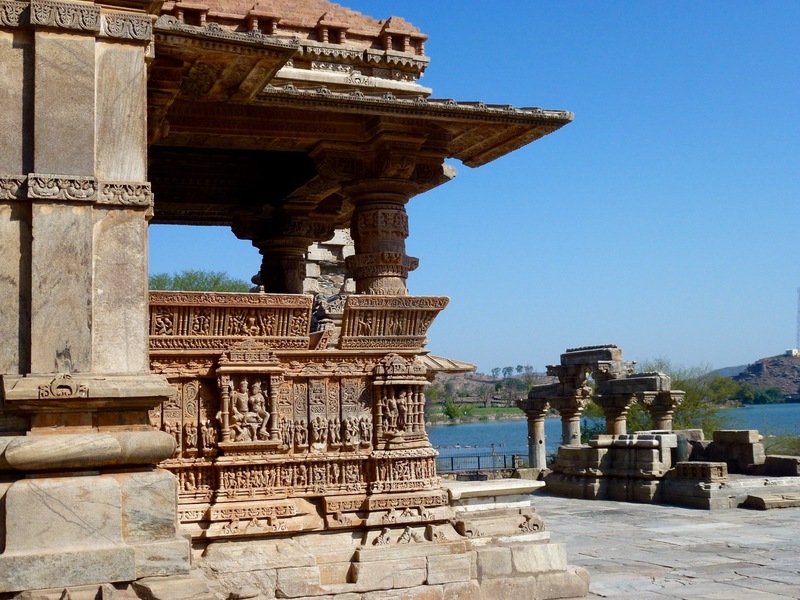 We had a car and driver at our disposal which made the below locations easy to visit in a day trip from Udaipur. Monsoon Palace (Sajjan Garh). For a great view of Udaipur and Lake Pichola, go to the Monsoon Palace, located on a hilltop about 4 miles west of the city. The palace dates to the 19th century and was originally an astronomical observation post and then became a hunting lodge. 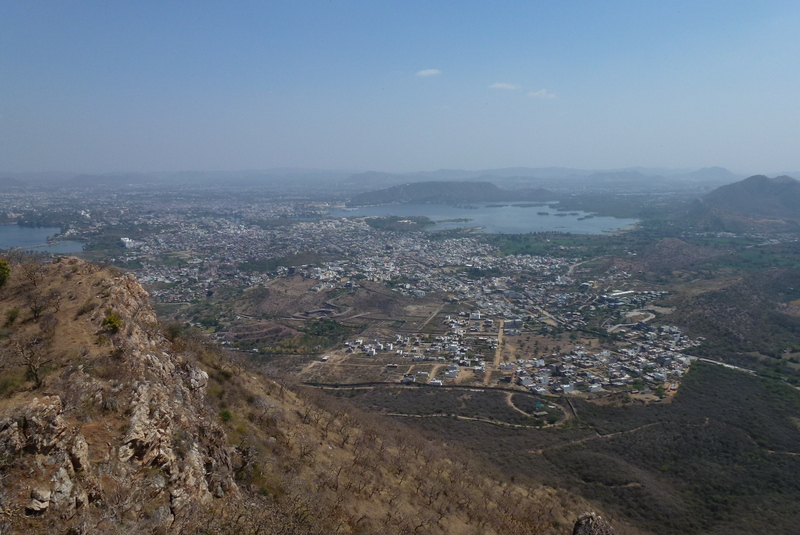 A view of Udaipur and Lake Pichola from the Monsoon Palace. 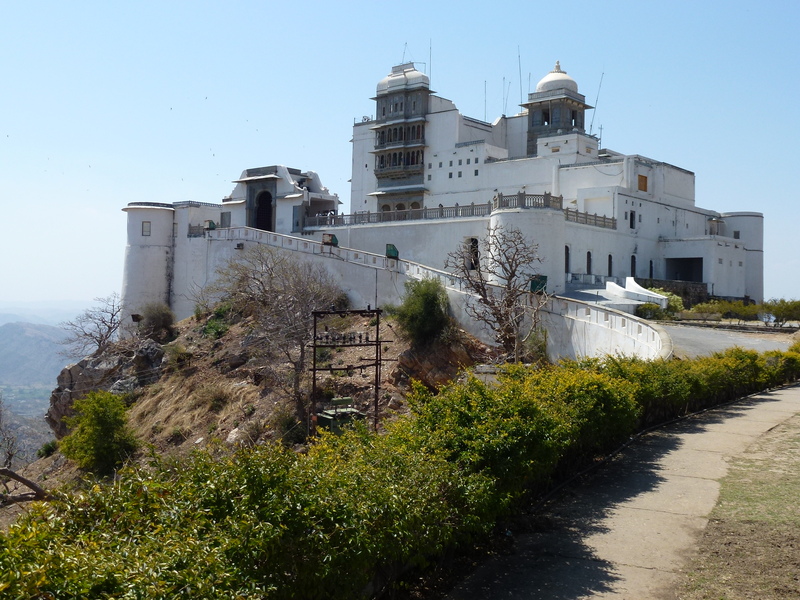 The Monsoon Palace – a good place to be during the monsoons – no chance of flooding! 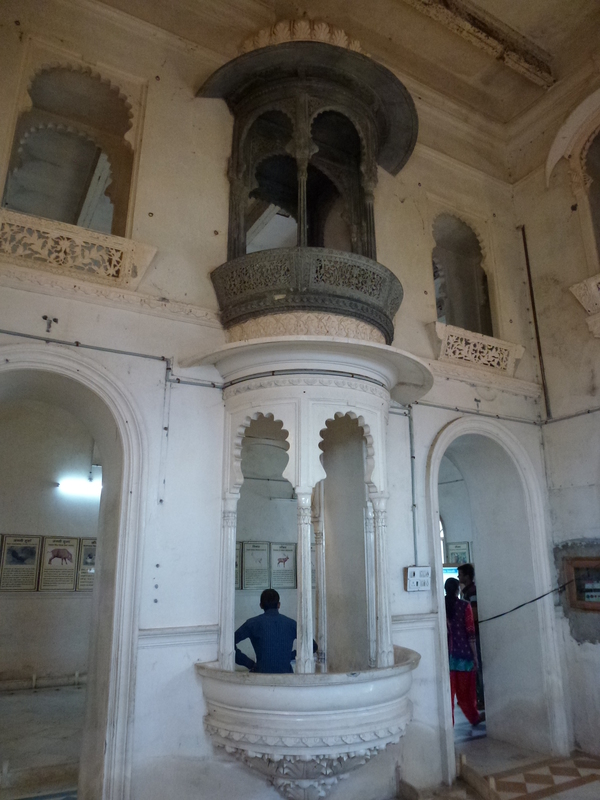 Interior view of the Monsoon Palace. 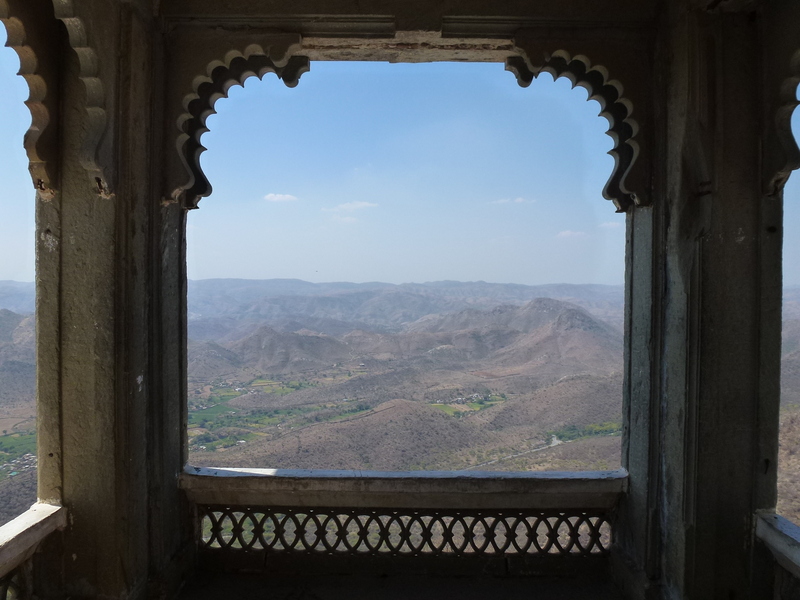 A view looking west from the upper floor balcony of the Monsoon Palace. There isn’t a lot to see in the interior but the views are terrific. Eklingji Temples. 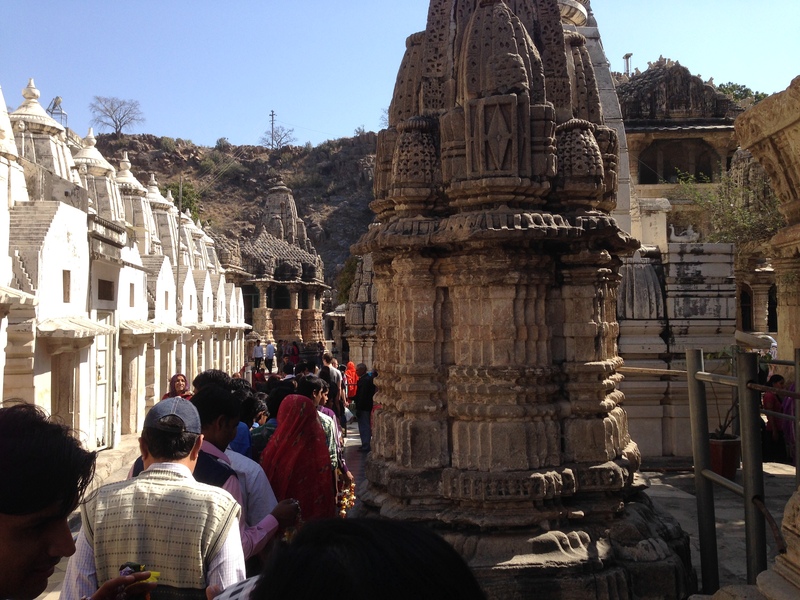 This is a busy complex of 108 Hindu temples and shrines dedicated to the Lord Shiva right in the heart of Eklingji (also known as the town of Kailashpuri), just 14 miles north of Udaipur. The main temple dates from the 16th century. Officially no pictures are allowed inside, but I managed to get a few. Women purchasing flower offerings prior to entering the Eklingji temple complex. Entering the Eklingji temple complex with worshippers. Detail of the carvings on the main temple (16th century). Another view of the Eklingji temple complex. I noticed that local postcards show a great rooftop view of the complex, but I couldn’t see how to get a picture from above. It is a great place to wander around and observe the local worship rites. No shoes are allowed inside and your feet will get dirty! Take some wet wipes to wash up afterwards. 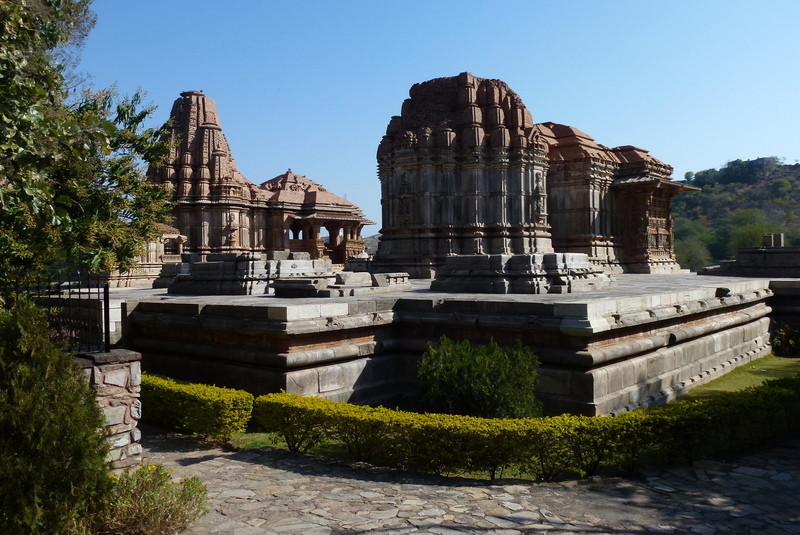 Saas-Bahu Temples. 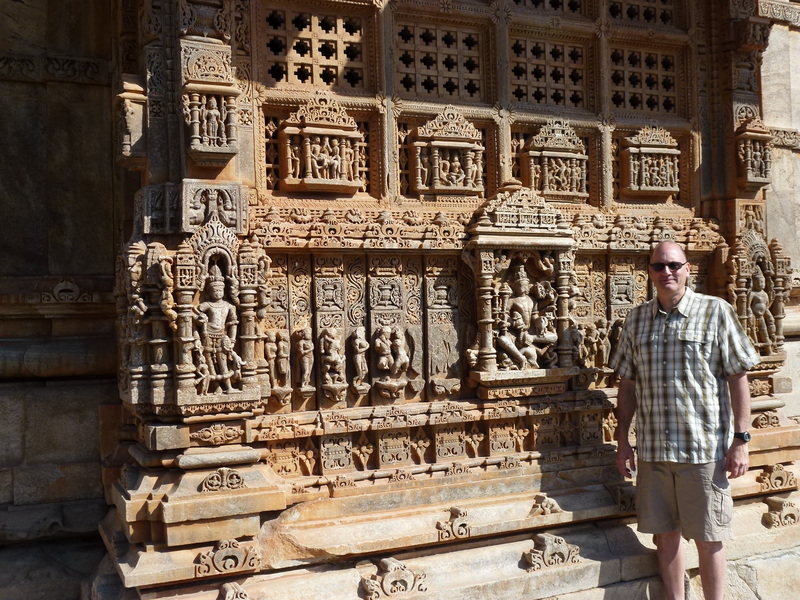 We loved these beautiful Hindu temples and had this peaceful, green, rural site to ourselves. They are a short distance from Eklingji above. 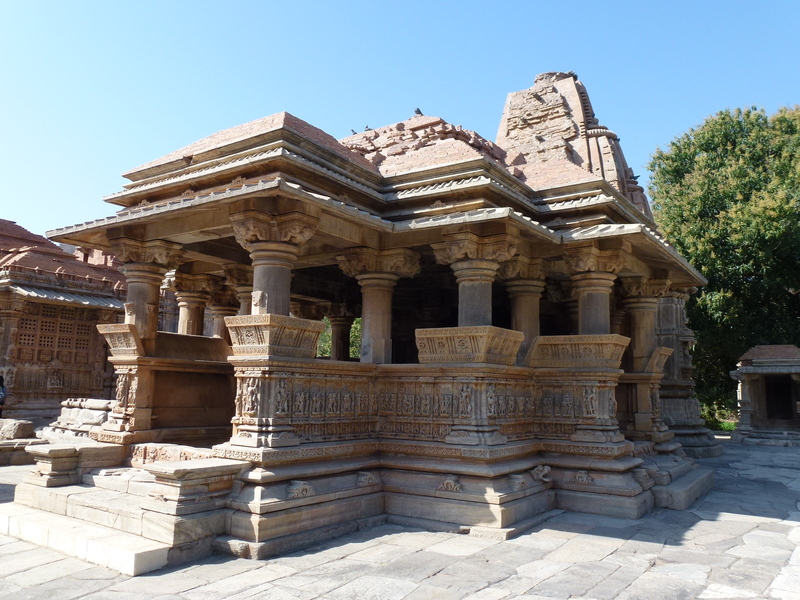 The temples are dedicated to Vishnu, a Hindu god. They are in excellent condition, being well preserved from the 11th century. 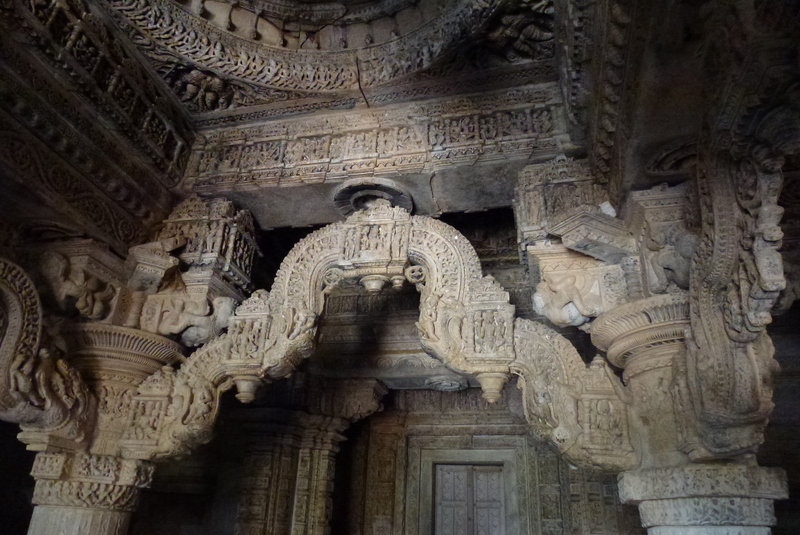 Some of the intricate carving work at the Saas-Bahu temples. View of the Saas-Bahu temples. 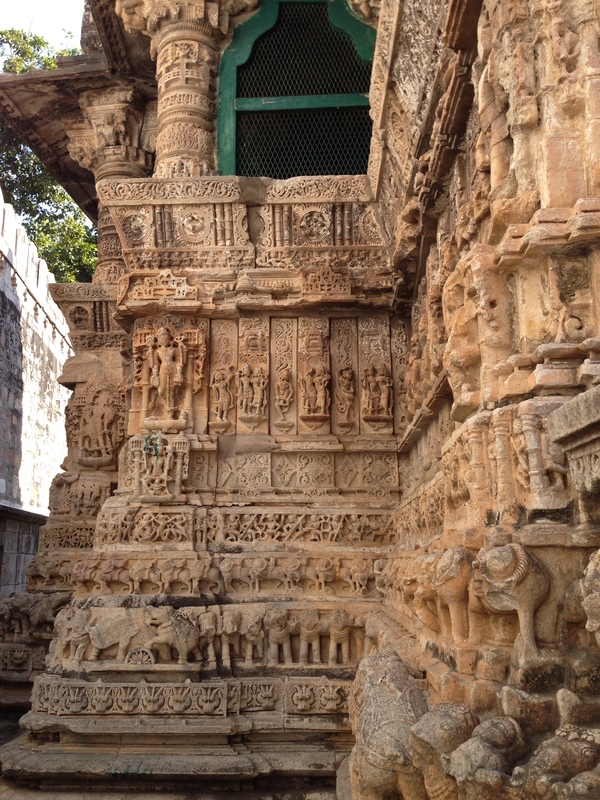 Another view of one of the Saas-Bahu temples. The temples and the nearby small lake. There is a small lake nearby that has some partially submerged temples as well. I should have brought my mask and snorkel. A wonderful stop. Wow, I really enjoyed going through a lot of your blogs. I’ve usually just read the one that comes through the email, but was enthralled by a lot of the Indian sites. I totally want to visit India now. Thanks! It’s an incredible country, Mark. Literally thousands of things to see. We just skimmed the surface. More posts to come!